i can't figure out why this scored so low, maybe if it was posted in a bigger size 800x800 or whatever the max size was in 2008... 640x640? anyways, nice! I love this photo. It's like a cute version of some scary movie poster where the bad guy is peering through the glass...only this time it's a kitten. Very creative IMO. Haha, Love this. I have a pure white cat named Tidus that loves water too. Are white cats just weird? Wonderful and creative POV. Congrats on the Posthumous Red. Well deserved. Unbelievable, even by DPC standards that this doesn't even warrant top 100. I hope the favourites and personal ribbons are some consolation. Can't give you mine as I didn't vote the challenge, but I think you might well have made that mark. Great shot. Definitely a unique and good image. Still wish I could see it bigger - make an excellent large print. When viewing this during voting, it took a while to decipher 'what' I was looking at - a Gizmo, Furby, cat, dog ... I now see this is Fry and, Challenge definitions aside, this is also typical behaviour of his and in that respect a good 'unusual' portrait, a very nice moment capture. Wow. I gave this an eight, I guess people voted it low thinking it didn't seem a portrait. I love it though! Thanks for sharing it. An absolutely briliant portrait, very well done! I am so dissapointed this didn't do better, because this is simply wonderfull! Never in a previous challenge, have I ever felt so strongly about the merit of an image to win! I am so so dissapointed to say the least and very disillusioned, in fact I am livid this didn't ribbon! This photo says so much about the character of its subject and the creativity of the photographer! Its a real gem and I can't praise it enough! I'm just thankfull to epescala for sharing it with us and I offer my apology to her for my image having scored higher - I'm ashamed for this site! This result reinforces that fact that great photography doesn't always win the popular vote! p.s. take solace from the fact that many of the greats (e.g. ansel adams and the like) would probably have done very poorly on this site! Originality is dying on this site it seems...long live originality!!! Just right... this gets my Posthumous Red Ribbon. Perfectly quirky - outstanding take on the challenge. Interesting take on the challenge. Kitty looks awfully forlorn. 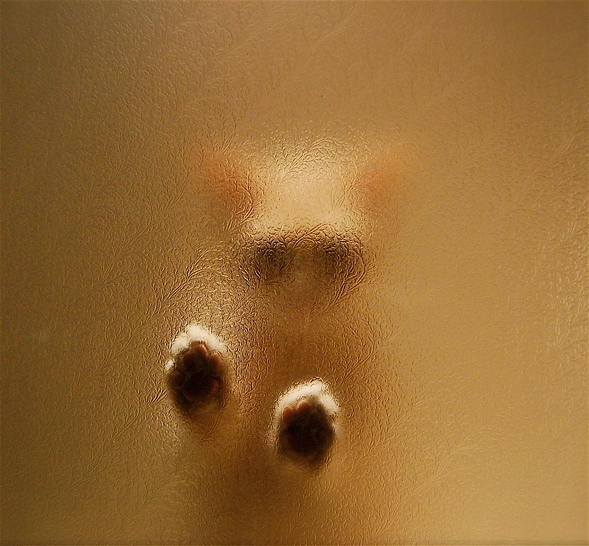 Quite a mysterious portrait, like the paws but miss seeing the face. I really like the idea but can only vote 5 for this particular challenge. Very interesting effect. It works for me. This is so so wonderful...original and completely different to the normal un-inventive trash currently being voted on! This definately wins my blue ribbon by a mile, and you haven't even copped out and traded on the cuteness factor! 9. Really, really hope this wins, if only to keep me sane!!! haha..love it..!! This is just too cool! FAV!! When I saw the thumbnail of this one, I thought "hmmm, that seems really interesting." When I saw the full size shot I was sort of left in the humdrums. I will say that the texture of the door adds visual interest. What a marvelous idea and excellent execution! different. and very cool. good work. I like this idea, but I guess some other will vote it down, because they can't see soft flur or big cute eyes. Unique, and maybe even a little creepy. Very effective, in any case. 8. This is really cute! Don't know how well it will score next to the other portraits where you can see it, but I think this one is so much better than a lot I have seen. It is definetly a very acurate image of exactly what cats do! well done! Cute... but not really a pet portrait, since I can't see the pet. Good image, just not that suited to this Challenge (my opinion). Proudly hosted by Sargasso Networks. Current Server Time: 04/23/2019 03:52:53 PM EDT.